Can the Quality Wings Avro RJ handle RNAV approaches? If so, how do I set this up for descent? I note that there is a GPS button between the VOR/LOC and APP buttons. Do I use this for RNAV approaches? I want to be able to get the aircraft to descend at a controlled rate for final approach. Fairly sure the GPS button is for non-FMC users to make it follow a default FS flight plan and isn’t in the real Avro. Thr Avro has VNAV, iirc. You should be able to use VNAV to manage your descent rate, as well as LNAV for your lateral path. The VNAV approach the ARJ airplanes can fly are of the former standard used up until recently, without IAN or LPV type capability. And no RNP/ANP for lateral nav. Basically the same capability 1980s era Boeing had up until they were very recently retrofitted with newer FMCs. So VNAV approaches are flown as a VNAV/LNAV coupled approach on the ARJ aircraft aka a GPS RNAV Approach. Ensure/verify that the altitude constraints are correctly set in the FMC after selecting the approach and set the MCP for Minimums or the FAF altitude. This will give you vertical guidance from the STAR, IAF and down to the Final Approach Fix. At the FAF VNAV should be disconnected as there is no Map Waypoint to follow the 3 degree angle down to the runway automatically and the ARJ is not IAN capable like a modern Boeing or Airbus, so the minimum will be higher. 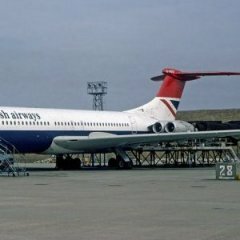 These are 1980s era airplanes through and through. Ignore the GPS button, that button has no function (Only for Beginners) unless the airplane is changed from the default realistic mode to lite mode which allows less proficient users to do things such as use the default gps/flightplanner for lateral navigation instead of the FMC. So, if I select the RNAV35 approach into LGKR Corfu, I need to set everything up as you have indicated above? Is that FT's airport, Christopher? Have most of their stuff but not this one. What's it like. A good representation of Corfu as I have flown there many a time, on vacations? I have never been to Corfu in the real world, but this scenery is very good indeed (as you would expect from FlyTampa). The entire island is super detailed (including the airport), and framerates on my mediocre PC are excellent.